My son absolutely loves 'Batman (and anything/anyone that has an once to do with him),' and in his eyes this character cannot do anything wrong! I know that no matter what, this hero will always be a star in my son's eyes so I only try to read him stories that will keep this spark alive! "Green Lantern vs. the Meteor Monster!" is a refreshing tale about a different sort of hero with a different sort of villain. This monster is different from the get go as it enters into this world through the atmosphere and crashes into the earth like a force to be reckoned with! Along with the help of other heroes, this 'monster' is returned to where he belongs and the world is returned to to some resemblance of normal. My son recently picked this book as the one he wanted. His only experience with the Green Lantern was toys from kids' meals. But he loves the idea of a ring that can create what you think of. This book was a little weird; I find the depictions of the super heros way too childish. Their proportions and ratios compared to each other and to the things around them is way off. It made it hard for me to enjoy. Now on the other hand, my son loved it. He loved seeing the green lantern, batman, superman and hawkman deal with the latest trouble. The story was geared for a younger audience. As stated my son loved it, but I really did not enjoy it.Read the review on my blog Book Reviews and More. My nephew told me that he liked this book, "it was," he said, "very good." So there you have it. It was a pretty good story. Full of action and excitement, and a nice sense of peril at first. The twist ending was well done, and quite unexpected. We enjoyed this one! If you have a child who loves super heroes, this book is for you. 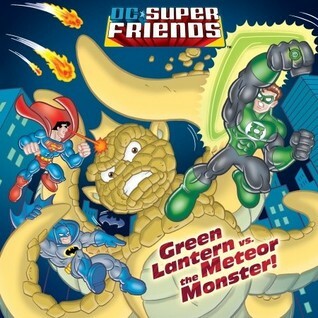 Green Lantern, Batman, Superman and Hawkman join forces to fight of an alien meteor baby causing havoc on Earth.